This morning it's official — the future is now. The Terrafugia Transition, the first plausible "flying car" (or more precisely, a "roadable aircraft"), took its first official flight earlier this month. Full gallery and video below. What do we know about the Transition? Well, it's an unleaded-fueled front-wheel drive vehicle on the ground, It gets a fuel economy of around 30 MPG and has a top speed of 65 MPH. The design features an automotive-style entry and exit and it'll retail at a street price of $194,000 when it eventually goes on sale. But, you can reserve one now for just $10,000 at Terrafugia's website. We'll have more as soon as the 9:30 AM press conference is over. Boston, MA – March 18, 2009: Terrafugia, Inc., a game-changing aircraft company, announced today the first flight of its Transition® Roadable Aircraft Proof of Concept. 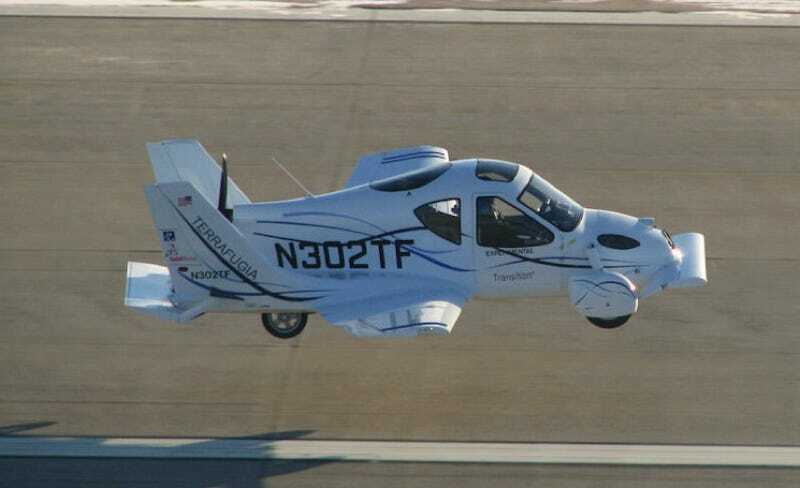 Often referred to as a "flying car", the Transition® is a two-seat aircraft designed to take off and land at local airports and drive on any road. Transforming from plane to car takes the pilot less than 30 seconds. An historic milestone for aviation, the flight comes after six months of static, road and taxi testing. The Transition® cruises up to 450 mi at over 115 mph, can drive at highway speeds on the road, and fits in a standard household garage. The vehicle has front wheel drive on the road and a propeller for flight. Both modes are powered by unleaded gasoline from a regular gas station. "This breakthrough changes the world of personal mobility. Travel now becomes a hassle-free integrated land-air experience. It's what aviation enthusiasts have been striving for since 1918," says Carl Dietrich, CEO of Terrafugia. By giving pilots a convenient ground transportation option, the Transition® reduces the cost, hassle, and weather sensitivity of personal aviation. It also increases safety by incorporating automotive crash structures and allowing pilots to drive under bad weather. For its first flight, the Transition® was flown by Phil Meteer, Colonel, USAFR (Retired) at Plattsburgh International Airport in Plattsburgh, NY. The chase aircraft was piloted by Giora Guth. Categorized as a Light Sport Aircraft, the Transition® requires a Sport Pilot license to fly. The Proof of Concept will undergo additional advanced flight and drive testing and a pre-production prototype will be built and certified before first delivery. Refundable airframe reservations are being accepted. Terrafugia (terra-FOO-gee-ah), based in Woburn, MA, is comprised of a team of award-winning engineers who have been advancing the state of personal aircraft since 2006. Founded by five pilots who are graduates of MIT and supported by a world-class network of advisors and private investors, Terrafugia's mission is the innovative expansion of personal mobility. "Terrafugia" is Latin for "escape from land." The Transition® will temporarily be on exhibit at the Museum of Science, Boston on March 18, 2009. Terrafugia would like to acknowledge and thank its corporate sponsors: Solid Works Corporation and CableOrganizer.com. Additionally, the following business partners have contributed to a successful first flight by furnishing equipment and services: Garmin International, Dynon Avionics, CO Guardian, David Clark Company, Bose Corporation, Icom Inc. and Air Graphics LLC.